We are also preparing for the annual international management conference and the case competition. Stop by a meeting and get involved! On November 14, 2015, the Society for the Advancement of Management (SAM) organized a trip for its members to Hershey, Pennsylvania to learn about hospitality management. Students who attended included Veronica Krolikowski, Miguel Diaz, Brian Tirado, Sarah Spaulding, Nashaun Scott, Anthony Hudson, Lizbeth Hernandez, and Dakota Rakus. 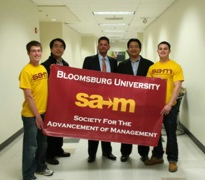 Dr. Lam Nguyen, the faculty advisor, together with his mother and son, accompanied the group. The trip consisted of a tour of Hotel Hershey, a tour of Hershey Lodge, lunch at Chocolate World, and a visit to Hershey Candy Lane. Overall, it was a wonderful, fun learning experience and made a few of the SAM members consider pursuing careers in hospitality. Society for the Advancement of Management (SAM) and Beta Gamma Sigma (BGS) held a bake sale in October 2015 to benefit Jane Adeny Memorial School for girls (JAMS) in Kenya. The groups used the proceeds from the sale and private donations to purchase undergarments for the girls at the school. Thanks to the efforts of SAM and BGS members, each girl at JAMS will now have a pair of underwear to wear for every day of the week. This April, SAM proudly presented Kevin Seely. Be on the look at next year as SAM is planning on bringing Kevin back again for yet another ZIPD approved event. Bloomsburg University's Zeigler Institute for Professional Development is a comprehensive educational experience designed to build the personal and professional capacities necessary for career success through training and education in business etiquette, professional attire, interviewing, networking and resume writing.